In this lesson, we will learn how to use the equal sign to complete addition and subtraction equations with numbers up to 20. 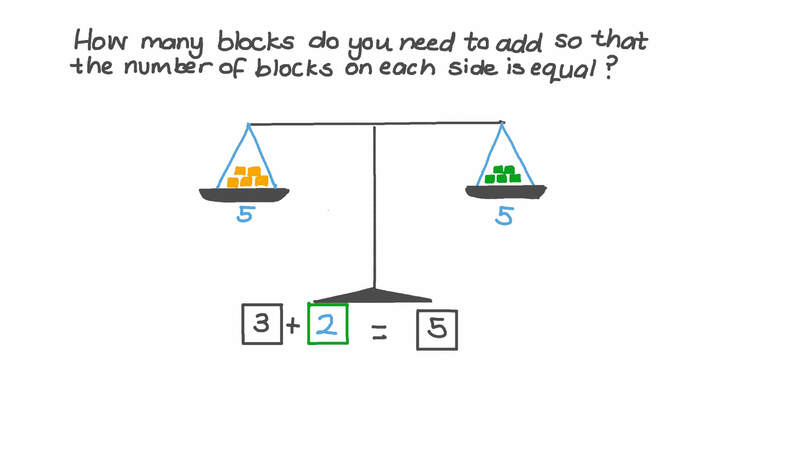 How many blocks do you need to add so that the number of blocks on each side is equal? Place + and = in the correct place: 9 ⋯ 2 ⋯ 7 . Is this correct: 2 = 3 ? Am I using the equal sign correctly? Check if the two sums are equal. Which of the following could have an equal sign added between them? 1 6 − 4 is equal to 12. Find the equation which uses the equals sign to say that. If we have a row of 13 green blocks and 6 orange blocks then we have the same number of blocks as 19 blue blocks. We say that 13 + 6 is equal to 19. Use the equal sign to write an equation which expresses that.